1. Daily goals. Without a clear focus, it’s too easy to succumb to distractions. Set targets for each day in advance. Decide what you’ll do; then do it. 2. Worst first. To defeat procrastination learn to tackle your most unpleasant task first thing in the morning instead of delaying it until later in the day. This small victory will set the tone for a very productive day. 3. Peak times. Identify your peak cycles of productivity, and schedule your most important tasks for those times. Work on minor tasks during your non-peak times. 4. Mini-milestones. When you begin a task, identify the target you must reach before you can stop working. For example, when working on a book, you could decide not to get up until you’ve written at least 1000 words. Hit your target no matter what. 5. Slice and dice. Break complex projects into smaller, well-defined tasks. Focus on completing just one of those tasks. 6. 30 days. Identify a new habit you’d like to form, and commit to sticking with it for just 30 days. A temporary commitment is much easier to keep than a permanent one. You will be amazed at the results. 7. Do it now! (That should be your mantra) Recite this phrase over and over until you’re so sick of it that you cave in and get to work. 8. Single-task. Stop multi-tasking (seriously, stop) at least not on a day-to-day basis. Instead, focus on one task at a time. This leads to greater productivity and less stress. 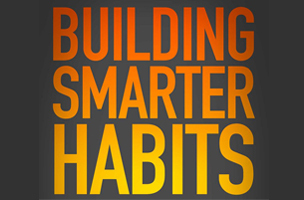 Building Smarter Habits: The Daily Habits of Insanely Productive People That Stick, is available as a free download from Amazon on Tuesday 5/13/14 and Wednesday 5/14/14. As of this writing, the book has an average of 4.5 out of 5 stars from 4 customer reviews. For more free eBooks, check out our 10 Websites to Download Free eBooks list, as well as our Free eBook of the Day archive, previously, on Appnewser.